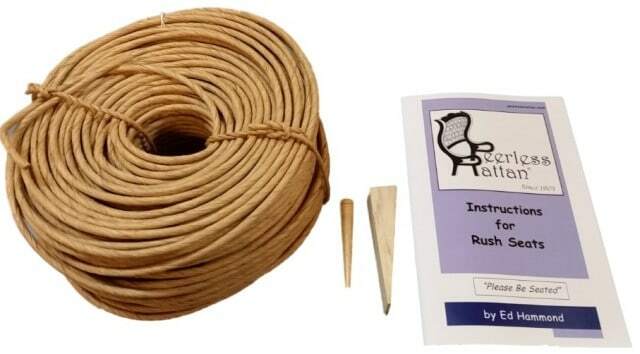 Complete Fibre Rush Weaving Kit 4/32, 5/32, 6/32, 7/32, 8/32 Kraft brown or 6/32 White. Most chairs require size 6/32, beginning weavers will find size 5/32 easier to work with. This is a complete Fibre rush seating kit. It should be enough for one small to medium sized chair seat. 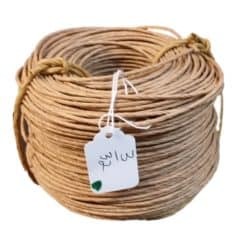 It includes your choice of a 2 pound coil of 4/32, 5/32, 6/32 7/32, or 8/32 Fibre Rush in Kraft brown or White (6/32 only), 1 peg, 1 wedge plus instructions. The instructions are a 20 page full color booklet full of close up photos and tips. It’s meant for the beginning weaver, but an experienced caner will benefit from some of the tips offered. It was written and produced by Ed Hammond, who has been weaving rush seats for over 30 years and has taught many classes.